The perfect introduction to Bali's fascinating culture and handicrafts, picturesque rice paddy fields, traditional villages and a spectacular lake and volcano. Your journey takes you to Batubulan, known for its stone carving and ornate temples, here you will see the exciting Barong Dance. A traditional dance that portrays the eternal struggle between good and evil, the religious and the profane and with a dramatic ending. Continue on through the woodcarving village of Mas. Watch artisans chipping intricate designs from wood blocks. Then visit the fantastic 11th century Elephant Cave (Goa Gajah) before moving into the cool mountains of Kintamani. 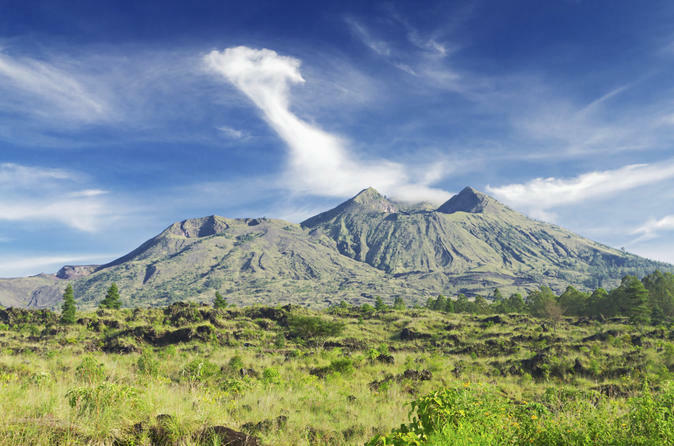 View Mount Batur an active volcano with its ribbons of black lava running down its peak to the valley below. Beside lies the shimmering lake of Batur. Enjoy lunch in a restaurant providing wonderful views (lunch is at own expense). On the return back you will stop at the Holy springs which are believed to have magic curative powers. Visit Ubud the artistic heart of Bali and Celuk the gold and silver making center on route.